This is the monument marking the grave of Nettie Gillespie Wright in Greensboro, NC’s old First Presbyterian Cemetery. I’m not sure of her birth and death dates, although one genealogical source states that she was born in 1862 with another report on Ancestry added that her birth month was May. The words on the marker, “MY HAPPY CHILD” suggest that she didn’t survive until adulthood. The verse on her marker is another clue that she died very young. 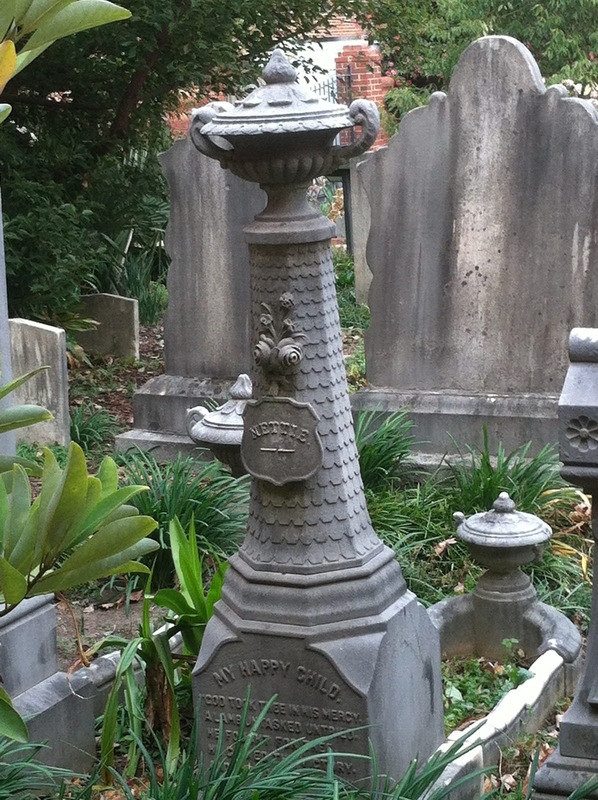 Nettie’s pedestal marker incorporates some of the popular features of Victorian funerary art such as the boxed flower planter, a bouquet of roses (above her name), and the two urns which symbolize a life that had ended prematurely. Nettie was the daughter of Col. Clement Gillespie Wright and Annette Eliza Lindsay Wright. Nettie could be her given name, or it could be short for “Annette.” I have noticed that many girls during this time period were named after their mothers, a practice that we’re used to seeing now more commonly with males only. Clement was the son of Governor Isaac Wright. Annette was a member of the Lindsay family who was prominent in Guilford County. The Wrights lived in Fayetteville where Clement practiced law prior to his service in the Civil War. He and Annette had two sons, in addition to Nettie. J. Lindsay Wright (1861-1882) and Clement G. Wright Jr. (1864-1937). J. Lindsay is buried next to Nettie, having died at the age of 22. Clement Sr. died of disease during the war in 1865. According to Annette’s Find A Grave memorial, she and the children moved back to Greensboro after Clement’s death to be closer to her family. While looking for information on Nettie, I came across her grandfather’s will information, specifically the part about his ownership of slaves. While Clement Sr. is mentioned, I am not sure what his involvement was in regards to slave ownership.